Yoga improves flexibility, posture, concentration, balance, and mood. Why yoga? Besides being fun for kids, who are attracted to the various animal related poses, yoga improves flexibility and studies show it can also improve posture, concentration, balance, and mood. Many teachers also add meditation, finding that it helps calm students and is an effective way to transition students to other classroom activities. Here we provide a few starter yoga poses, showing not only kids, but dogs as well! The Rolling with Mutt-i-grees® Ball Pose stretches the lower back and strengthens the core muscles. Have students sit with their knees bent in front of them. Ask them to wrap their arms around their knees and hug their legs to their chest. Have students slowly roll backwards until their entire back is on the floor, reminding students to continue to hold onto their legs. Then ask students to roll back up to a seated position, similar to a rolling sit-up. Repeat 15-20 times. The Mutt-i-grees® Belly Rub Pose stretches the leg, back, and core muscles. Have students lie down on the floor with their legs in front of them. Ask them to raise their legs in the air and wiggle them around, as if someone was rubbing their bellies. Then have students bring both of their legs together in front of them, with their knees bent. Have students rest their legs on the ground, first twisting to the right and then to the left. Remind students to breathe deeply as they stretch. The Mutt-i-grees® Cat and Dog Pose stretches the upper and lower back muscles. Have students get down on their hands and knees and arch their backs and look up – this is the dog pose. Hold this pose for 10 seconds. 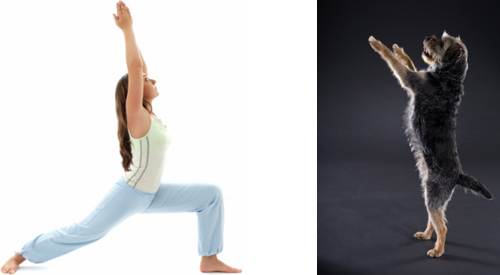 Then have students bring their bellies in, round their backs, and look down towards their knees – this is the cat pose. Hold this pose for 10 seconds. Repeat 20 times and remind students to breathe deeply as they hold each pose. The Downward-facing Dog Pose stretches and strengthens the entire body. It is also one of the most popular and well-known yoga poses. Dogs often stretch like this when they are ready to play. Have children stand in a circle or in rows. Ask them to get on their hands and knees, with their hands underneath their shoulders and their knees underneath their hips. Have the children curl their toes under and push back raising their hips and straightening their legs, if they can. Some children may have difficulty straightening their legs at first; this is okay and will improve with practice. Ask the children to spread their fingers and let their heads hang. Then ask them to move their weight into their hips and rest back on the rear part of their bodies, taking the weight off their arms. Remind children to keep their “tails” high and to sink their heels towards the floor. Hold this pose for 10-20 seconds, reminding children to breathe deeply. The Mutt-i-gree stretches the hips, thighs and ankles and is a good relaxation exercise. Have you seen dogs sit like this, with their legs stretched out in front of them? Have children sit in a circle or in rows with their knees bent and their legs folded underneath them. Their knees should be separated, about the width of their hips. Ask the children to place their foreheads on the floor and reach their arms out straight in front of them, reminding them to breathe deeply. You can create variations on this pose by asking children to cross their arms as they reach or to reach with one arm at a time. Hold this pose for 10-20 seconds. Then ask the children to turn their head to the side so that their cheeks are on the floor. Have them move their arms to their sides, again, reminding them to breathe deeply. Hold this pose for 10-20 seconds. The Warrior Pose strengthens the legs and opens the chest and shoulders. Dogs often stretch like this when they are waking up from a nap. Have children stand in a circle or in rows with their feet together and their hands at their sides. Ask them to take a giant step forward with their right foot and bend their right knee, while keeping their left leg straight behind them (lunge). Ask them to reach up to the sky as high as they can and arch their back. Hold pose for 10 seconds. Switch legs and continue.